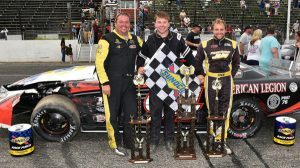 Scarborough, Maine – Garrett Hall of Scarborough prevailed in spectacular fashion Sunday afternoon in Pro All Stars Series Super Late Model competition, just beating out nine-time PASS champion Ben Rowe of Turner in a wild finish that saw Hall’s car need a tow to Beech Ridge Motor Speedway victory lane. Hall, who was seeming unbeatable on long green flag runs during the second half of the 150-lap race, saw a trio of late-race restarts put both Rowe and the reigning PASS Super Late Model champion, DJ Shaw of Center Conway, New Hampshire, in contention. Rowe took an aggressive run on the inside of Hall on the final lap and wheels were in the air as Hall’s defense of the lead was good enough by a margin of .012-seconds. It was the first Pro All Stars Series victory of the season for Hall and the Risbarra Construction / Blackpoint Motorsports 94. He won three races on the tour last year. Rowe, in championship contention despite going winless thus far in 2017, was the runner-up aboard the Richard Moody Builders 4. Defending Series champion Shaw was third in the Precision JLM 60. Both Shaw and Travis Benjamin, who finished fourth, battle back after the race’s first major altercation, which eliminated recent Beech Ridge and current Oxford 250 champion Curtis Gerry of Waterboro. Alan Tardiff of Lyman, who just wrapped up the Super Late Model championship at Oxford Plains Speedway, rounded out the top five. Derek Griffith, Glen Luce, Donnie Colpritt, Dan McKeage and Mike Rowe filled out the top-ten rundown. Early frontrunner Reid Lanpher of Manchester ended up 16th after late-race difficulties. Jimmy Emerson of Windham scored an emotional victory in the 40-lap PASS Mod race. It was the second victory this season for the veteran racer, but his first since joining the PASS touring class at what has been his home racetrack since the dirt days more than three decades ago. Championship leader Ben Tinker of New Gloucester chased Emerson through most of the race and earned runner-up honors, in front of Mark Lundblad, Jr. of Conway, New Hampshire. Lebanon’s Mike Carignan and Matty Sanborn of Windham rounded out the top five. David Whittier of West Poland raced to his first-ever Beech Ridge Motor Speedway win in the 75-lap Quad Series race for Street Stocks. Whittier raced second in the race’s early laps before taking the lead away from Quad Series points leader Bryce Mains of Bridgton, who had wrecked his car in a Saturday practice session. Mains held off the rest of the field to claim runner-up honors as Whittier dominated the second half of the race. Tyler King of Livermore charged from deep in the field to claim a well-earned, third-place finish. Kyle Hewins of Leeds was fourth, followed by 2017 Oxford Plains Speedway champion Billy Childs, Jr., of Leeds. Terry Merrill of Saco was dominant in a 50-lap special event for the Sport Series cars competing weekly in the track’s NASCAR Whelen All-American Series. Merrill started eighth and moved into contention quickly, eventually outrunning Scarborough’s Richard Pelton to the checkered flag. Benton’s Barry Poulin crossed the finish line in fourth position, followed by the event’s early racesetter, Ryan Villacci of Falmouth. The next Pro All Stars Series North Super Late Model race is scheduled for Saturday, September 23 at White Mountain Motorsports Park in North Woodstock, New Hampshire. For more information please visit proallstarsseries.com or call (207) 539-8865. Pro All Stars Series Super Late Model (150 laps) 1 94 Garrett Hall, Scarborough; 2 4 Ben Rowe, Turner; 3 60 DJ Shaw, Center Conway, NH; 4 7 Travis Benjamin, Morrill; 5 9 Alan Tardiff, Lyman; 6 12 Derek Griffith, Hudson, NH; 7 7 Glen Luce, Turner; 8 16 Donnie Colpritt, Jr., Scarborough; 9 40 Dan McKeage, Gorham; 10 24 Mike Rowe, Turner; 11 51 John Peters, Westbrook; 12 44 Trevor Sanborn, Parsonsfield; 13 27 Wayne Helliwell, Jr., Dover, NH; 14 77 Nick Reno, West Bath; 15 60 Tim Brackett, Buckfield; 16 59 Reid Lanpher, Manchester; 17 23 Dave Farrington, Jr., Jay; 18 42 Corey Bubar, Windham; 19 50 Jeff White, Winthrop; 20 81 Dan Winter, Windham; 21 72 Scott Robbins, Dixfield; 22 11 Dalton Gagnon, Lyman; 23 56 Evan Beaulieu, Durham; 24 14 Scott McDaniel, Livermore; 25 32 Anthony Nocella, Woburn, MA; 26 61 TJ Brackett, Buckfield; 27 88 Brandon Barker, Windham; 28 2 Chad Dow, Pittsfield; 29 54 Johnny Clark, Farmingdale; 30 48 Bobby Timmons, Windham; 31 7 Curtis Gerry, Waterboro. PASS Mods (40 laps) 1 Jimmy Emerson, Windham; 2 19 Ben Tinker, New Gloucester; 3 28 Mark Lundblad, Jr., Conway, NH; 4 21 Mike Carignan, Lebanon; 5 64 Matty Sanborn, Windham; 6 60 Gary Shackford, Center Conway, NH; 7 33 Steven Jones, Saco; 8 29 Natasha Dyer, Tamworth, NH; 9 44 David Grystwicz, Standish; 10 2 Randy Sanborn, West Baldwin; 11 27 Josh Hedges, Rochester, MA; 12 5 Devin Curit, Saco; 13 16 Patrick Sullivan, Poland; 11 25 Bruce Helmuth, Wales; 15 17 Scott Alexander, Glenburn; 16 85 Jariet Harrison, Freeport. Street Stock Quad Series (75 laps) 1 58 David Whittier, West Poland; 2 77 Bryce Mains, Bridgton; 3 11 Tyler King, Livermore; 4 51 Kyle Hewins, Leeds; 5 1 Billy Childs, Jr., Leeds; 6 4 Jordan Russell, Norway; 7 04 Zach Bowie, Poland; 8 36 Richard Spaulding, Lisbon; 9 85 Kenny Harrison, Durham; 10 61 Matt Dufault, Turner; 11 36 Nate Leavitt, Buxton; 12 2 Adam Lovejoy, Sanford; 13 21 Skipp Tripp, Norway; 14 75 Tucker Cole, Saco; 15 29 Max Dolliver, Londonderry, NH; 16 33 Andrew Breton, Greene; 17 4 Jason Gammon, Hollis; 18 55 Kurt Hewins, Leeds; 19 34 David Vaughn, Naples; 20 69 Ryan Lund, Westbrook; 21 28 David Cameron, Alfred; 22 39 Drew Morse, Buxton; 23 35 Kristina Nadeau, Buxton; 24 09 Mark Turner, Norway.